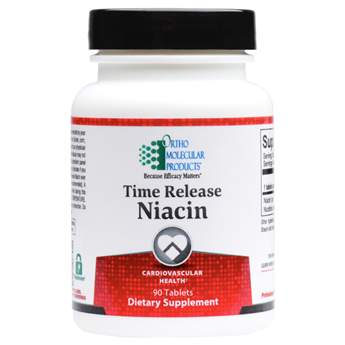 Time Release Niacin includes powerful support for cardiovascular health. This formula is a unique sustained-release tablet which allows for maximal benefit with minimal side-effects. Niacin is required by the body to promote the health and function of the digestive system, liver, skin and nerves. It also plays a role in converting food to energy. Niacin is found in dairy products, eggs, grains, as well as fish, lean meats, nuts and legumes. However, it is a water-soluble vitamin, meaning that excess is excreted through the urine and continuous dietary intake is necessary to support optimal health. Niacin is most notably known for its broad cardiovascular benefits, but is also an important nutrient for bone health, blood sugar balance, as well as cerebrovascular function. Niacin, also known as vitamin B3, is a micronutrient with a 40-year history of efficacy in supporting healthy lipid levels, especially high-density lipoprotein cholesterol (HDL-C) levels. However, one side effect often makes supplementing niacin a less than pleasurable experience: limited adherence. Some patients experience flushing when supplementing niacin. However, a properly manufactured, sustained-release niacin, like the one found in this formula, circumvents this side effect. By using a proprietary, natural wax-matrix coating technology, the Time Release Niacin formula is released slowly over a seven to eight hour period to reduce flushing. This time period is considered the ideal window for releasing equal amounts of niacin into circulation as nicotinuric acid, the beneficial metabolite responsible for niacin’s lipid balancing benefits.